The giant Grand Universe holographic vortex consists of the sub-universe vortexes all generated under the principles of the energy wave-particle vortex cells aggregation, organization and systematization, all the way down to the physical planetary PUMAs and their planetary life. Planets are the Supreme universe and its sub-universe wave-particle electro-magnetic vortex nebulae-sun spun-off energy-mater realizations in time and space. Therefore, the planets themselves, as indicated many times before are the energy-matter vortexes as well. In the below pictures we see the photographs of the Earth vortex (Picture 1) as taken by the Apollo 11 in 1969 (1), and Venus double vortex (Picture 2) taken by Venus Express in 2006 (2). 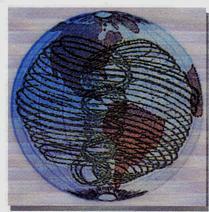 The Picture 1 presents earth’s main globe vortex, while the Picture 2 presents also the planetary (Venus) double vortex, i.e. main vortex with its inner sub-hemispheric vortexes. Planetary sub-hemispheric vortexes form in-between themselves the central interference plane, known as the equator (equal separator), in case of human body it is called the hemi-diaphragm. Let us, therefore, examine the relationship between the planetary and human central PUMAs energy relationships further, now first focusing on better known planetary central PUMA vortex interference equatorial “cosmic clock” plane and then examine its relationship to the human one serving and functioning here as the genome creating central interference plane. The earth with its own geo-magnetic axis rotates counter-clockwise (CCW) around it-self and around the sun. The earth’s four basic equatorial interference plane positions of its geo-magnetic North-South pole energy charge, relative to its central Sun are presented below in the Picture 13. - The Male PUMA DOMINANT direction of the 3FF energy POLARITY & CHARGE is CW & DOWN, i.e. from PUMA’s top (North Pole as +) to PUMA’s bottom (South Pole as -). - The Female PUMA DOMINANT direction of the 3FF energy POLARITY & CHARGE is CCW & UP, i.e. from Female’s PUMA bottom (South Pole as - /Male’s -/) to Female’s PUMA top (North Pole as + /Male’s +/. - The Earth’s geo-magnetic NORTH on the Earth’s Female PUMA DOMINANT (Female PUMA CCW polarity & UP charge) rotating equatorial interference plane, formed by the Earth’s Female PUMA active-upper and re-active-lower PUMA-halves, is positioned LEFT to the SUN-rise and represents the MID-NIGHT (24/00 AM point on the equatorial clock). - The EAST has been named the Earth’s interference equatorial plain facing the SUN(-rise) and represents the DAWN (6AM point on the equatorial clock). - The WEST has been named the Earth’s interference equatorial plane of the SUN-set also called the DUSK (6PM point on the equatorial clock). is also called the MID-DAY (12 PM point on the equatorial clock). The giant Grand Universe holographic vortex consists of the sub-universe vortexes all generated under the principles of the energy wave-particle vortex-cells aggregation, organization and systematization, all the way down to the physical planetary PUMAs and the PUMA-based planetary life. Because the planets, human body and the planetary life in general are the PUMA-type wave-particle vortex holograms, better understanding of the planetary PUMA vortex will help us to better understand the operation of the human body vortex and ultimately the gene energetics (“Genergetics”) and the human gene reproduction principles. There are two types of PUMA vortex holograms – Male and Female. *In Female PUMA the DOMINANT rotation of the interference plane is CCW and UP. The electrical (spiritual) 3FF energy force enters and exits from the PUMA vortexes top and bottom forming the longitudinal (meridians) vortex body electrical energy grid. The magnetic (matter) 3ff energy force enters and exits from the PUMA vortexes interference planes sides forming the latitudinal (parallels) direction of the vortex magnetic energy grid.